Almost five years ago, at the traditional KDE PIM meeting at Osnabrück, I drew the first version of the Akonadi architecture on a whiteboard. 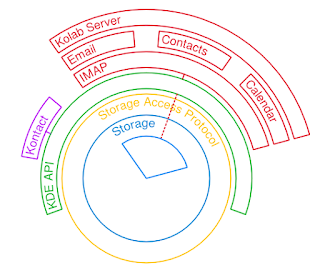 It felt appropriate to put the server into the center and arrange the different layers of the system around it in circles. The result was a beautiful diagram. Trouble stroke, when I tried to create a digital version of the diagram. 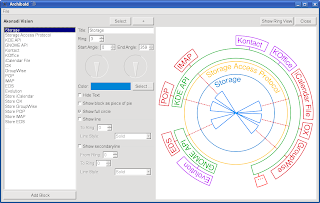 Putting texts on rounded shapes and arranging partial circle sections in a nice way was too much for all vector and diagram drawing applications I tried. So as a hacker, how do you solve problems? Right, you do it in software. So I wrote an editor for the diagram in Qt. The mission was accomplished, the diagram up on our web pages. 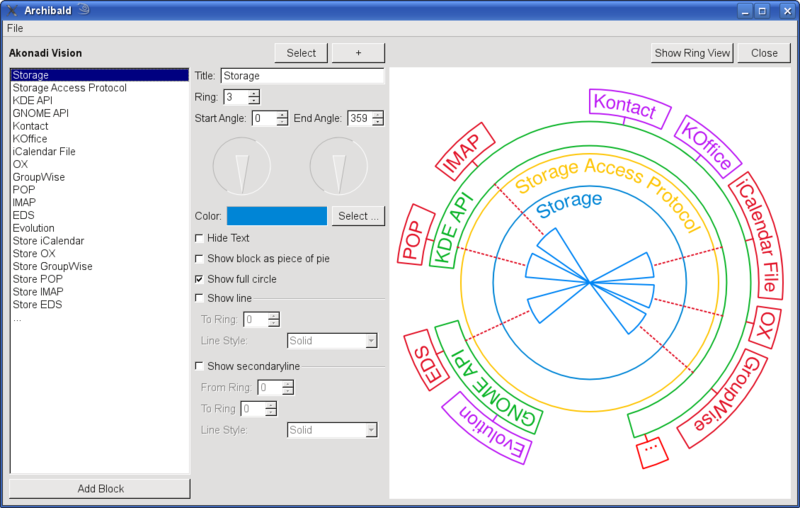 So the code for the diagram tool got buried under a pile of other stuff on my harddisk. But last winter, again at the traditional KDE PIM meeting at Onsbrück Steve reminded me of the tool by showing me an updated version with the then current state of the diagram, and a bit later at FOSDEM Paul complained that Kolab didn't show up in the first version. So there clearly was a need for an updated version of my tool. 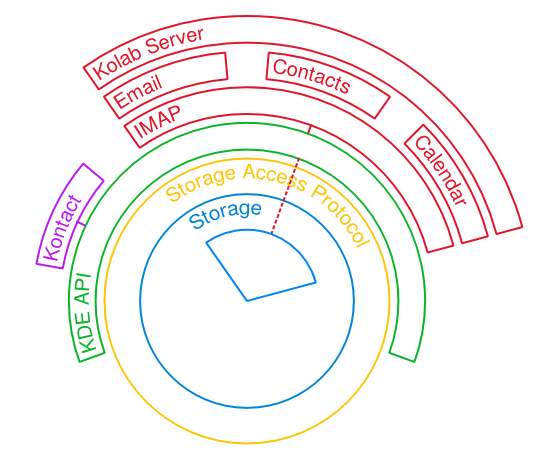 After a little bit of hacking the tool is now able to handle multiple versions of the diagram, and here is a view of Kolab in the Akonadi architecture. While hacking on the tool I also moved it into a git repository and published it on github. So if you want to have look, or if you feel inclined to play around with the Akonadi architecture, go ahead and clone Archibald. Let me know, if you do something interesting with it. I'm curious.